Landmarks suggested minor changes for proposed project at the corner of Henry and Kane Streets. 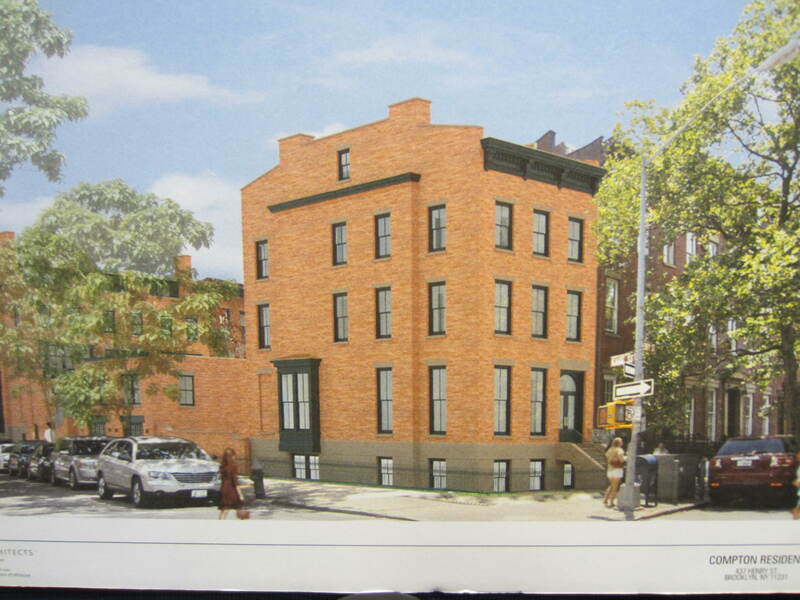 On August 7, 2012, Landmarks approved a proposal to develop a four-story building and two-story carriage house at 437 Henry Street in Brooklyn’s Cobble Hill Historic District. The lot sits on the corner of Henry and Kane Streets, and is occupied by a concrete-walled garden. The carriage house would be built behind the main building and face Kane Street. CWB Architects’ Brendan Coburn presented the proposal. Coburn noted that his firm had designed the three rowhouses proposed for an adjacent lot at 2 Strong Place, which Landmarks had approved in February 2012. Coburn said the Henry Street project would utilize the “same language” of brick and pre-cast brownstone materials common in the district. Both the main building and the carriage house would feature brick facades, brownstone lintels, and fiberglass cornices. The four-story building’s windows and cornice line would align with the neighboring buildings. A portion of the side wall would project slightly on the Kane Street facade to gain floor area. Mechanical equipment would be concealed within the building’s attic. The building would have a slightly more modern design at the rear facade, visible from Kane Street, with a two-story projecting bay window. Chair Robert B. Tierney led a unanimous vote for approval. LPC: 437 Henry St., Brooklyn (13-3398) (August 7, 2012) (Architect: CWB Architects).